Within EASY WALKING DISTANCE OF THE OLD TOWN and Offering exceptional value for money. This THREE DOUBLE BEDROOM terrace home boasts. A DOWNSTAIRS CLOAKROOM. SPACIOUS LOUNGE. Fitted KITCHEN BREAKFAST ROOM. Luxury REFITTED BATHROOM. UPVC double glazing. GAS CENTRAL HEATING and rear WESTERLY FACING gardens overlooking fields. UPVC double glazed front door opens to entrance hall, single panel radiator, stairs rise to the first floor with storage cupboard under, walk in cupboard. Low level wc, wash hand basin, tiled splash back area. Double glazed window to the front, range of storage units at base and eye level, work surface areas, one and a half bowl sink unit with mixer tap set below double glazed window to the rear, double glazed door to the rear garden, plumbing for washing machine, space for cooker, tiled surrounds, cupboard housing meters. Double glazed sliding patio door to the rear garden, single panel radiator, thermostat heating control. Stairs rise to the first floor, access to loft void, cupboard housing hot water cylinder and gas boiler serving central heating and domestic hot water, further storage cupboard. 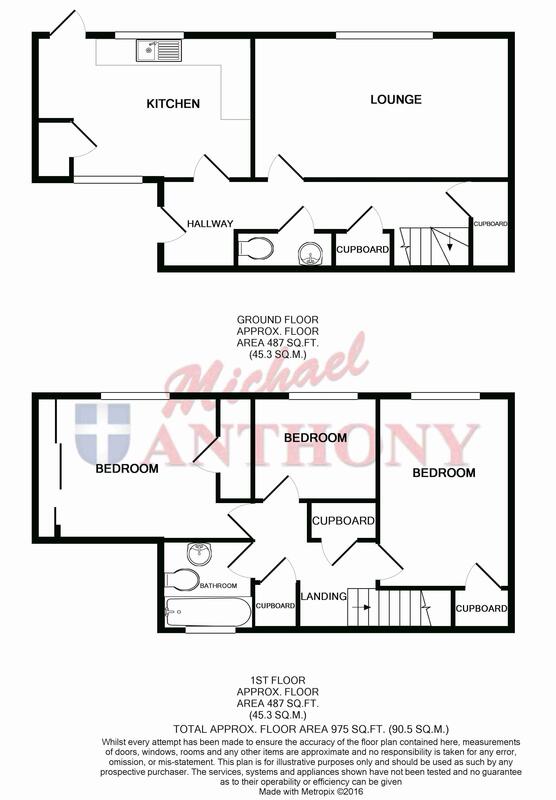 Low level wc, panelled bath, pedestal wash hand basin, double glazed window to the front, tiled splash back areas. Double glazed windows to the front and rear, double panel radiator, built in cupboard, mirror fronted doors to wardrobes. Double glazed window to the rear, built in cupboard, double panel radiator. Double glazed glazed window to the rear. Open plan paved front garden. Fully enclosed garden with paved patio to the immediate rear of the property, laid to lawn, gated rear access.